Above, left to right, Sophia Ho, Rob Fought (tournament director) and Sasha Gorchanyuk. 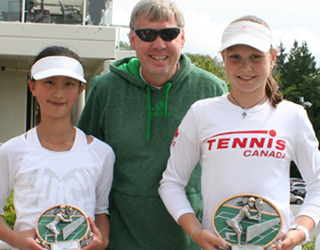 Sasha topped Sophia for the Girls' 12 Singles title at Hollyburn Country Club, May 20. Photo 1 (left): The top-seeded Kyryll Kryvchun beat his doubles partner, Daniel Raw, 6-0, 7-5 to win the Boys' 18 Singles. In the doubles, Kyryll and Daniel lost to Evan Mcnicol and Tejas Phaterpekar, 6-3, 4-6, 10-3, in the semis. Later, Evan and Tejas went on to win the Boys' 18 Doubles by beating Roy Cheng and Eric Fought in the final, 6-3, 6-3. Photo 2: Benjamin Sigouin, left, and Daniel Raw. Thirteen-year-old Benjamin lost to Daniel, 6-3, 6-2 in the Boys' 18 semis. Benjamin eliminated second-seeded Patrick Hall, 5-7, 6-4, 6-4, in the quarters, and finished third by beating Roy Cheng, 6-2, 6-0, in the Plate. Photo 3: Latonia Lam is all smiles posing with her coach, Steve Yesowick. Top seed Latonia defended her title by beating Camille Hemond, 6-2, 6-2, in the Girls' 18 Singles final. And for Camillef, she and her partner, Kaitlyn Bettauer outplayed Nicole Wrona and Tomoe Yazawa to win the Girls' 18 Doubles. Photo 4: Meet the Diemer family from Victoria. From left to right, Debbie, Daniel, Aaron and Greg. Aaron has improved a lot since his dad, Greg took over coaching him in September. Aaron overcame top-seeded Jerry Huang, 6-1, 7-6, in the Boys' 14 Singles final. Photo 5: Neel Phaterpekar, left , and Manroop Gill. Manroop outlasted Neel, 6-4, 1-6, 6-3, for the Boys' 16 Singles title. Later, Neel teamed-up with his brother Kiran to beat Manroop and his partner Larry Zhao, 6-1, 7-5, in the Boys' 16 Doubles final. Photo 6: Luna Crawford, left, and Stacey Fung. Stacey beat Luna, 6-3, 6-1, to capture the Girls' 16 Singles crown. Stacey and her partner, Kyla Jarrar defeated Cassie Chung and Alli Valk, 6-3, 6-0, in the Girls' 16 Doubles final. Photo 7: Victor Stepanov, left, and Luka Vukovic. Luka outplayed Victor to win the Boys' 12 Singles title, 6-2, 6-2. Luka later teamed-up with Stefan Mitrovic to beat Victor and his partner, Ty Mya, 6-2, 7-5, in the Boys' 12 Doubles final. Photo 8: Jessie Gong, left, and Michelle Lim. Jessie fended off Michelle to win the final of Girls' 14 Singles, 7-5, 7-5. Jessie also won the doubles with her partner, Sunny Liu. They beat Michelle and her partner, Keyu Chen, 7-6, 6-4. Photo 9: From left to right, Ben Kirsh, Max Korkh, Sam Gouneili and Christopher Chan. Sam and Christopher had a match point in the third set tie-breaker against top-seeded Ben and Max when Christopher cramped and they lost, 6-1, 6-7, 13-11, in the Boys' 16 Doubles. Ben, later, beat Max, 4-6, 6-4, 6-4, in the Plate to finish third in the Boys' 16 Singles. Photo 10: Un-seeded Max Gupta eliminated second seed Andre Sobati in the first round, 6-1, 6-0, then ousted fifth seed Tony Zhao in the quarters, 6-2, 6-2. Max reached the Boys' 14 Singles semis where he came short against Aaron Diemer, 6-2, 6-1. Andre and Tony later went to win the doubles by beating Taalib Bhatti and Jerry Huang in the final, 7-5, 7-5. Rain washed out all play at the Challenger event in Coquitlam on Friday and Saturday. However, Adrian Tan managed to complete all matches by 4 pm on Monday, May 20. Good job Adrian. For the list of the winners, click here.